Uncategorized – Page 2 – It's Hamiltime! As people try to recover and rebuild from Hurricane Harvey and Hurricane Irma, the hurricane coverage brought to mind Hamilton’s experience as a teenager living in St. Croix when it was hit by a destructive hurricane in 1772. It seemed as if a total dissolution of nature was taking place. The roaring of the sea and wind, fiery meteors flying about it in the air, the prodigious glare of almost perpetual lightning, the crash of the falling houses, and the ear-piercing shrieks of the distressed, were sufficient to strike astonishment into Angels. 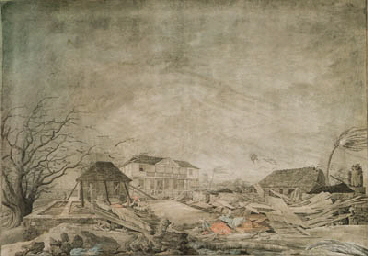 A great part of the buildings throughout the Island are levelled to the ground, almost all the rest very much shattered; several persons killed and numbers utterly ruined; whole families running about the streets, unknowing where to find a place of shelter; the sick exposed to the keeness of water and air without a bed to lie upon, or a dry covering to their bodies; and our harbours entirely bare. In a word, misery, in all its most hideous shapes, spread over the whole face of the country. Hamilton’s letter was published by the Royal Danish Gazette the following month. Hamilton Papers Digitized on Library of Congress Website!! In exciting news, the Library of Congress has digitized its extensive collection of Hamilton microfilm and made them publicly accessible. This gives us all unprecedented access to original Hamilton documents that you would previously need to review and request on microfilm. The collection, consisting of approximately 12,000 items dating from 1708 to 1917, documents Hamilton’s impoverished Caribbean boyhood (scantily); events in the lives of his family and that of his wife, Elizabeth Schuyler Hamilton; his experience as a Revolutionary War officer and aide-de-camp to General George Washington; his terms as a New York delegate to the Continental Congress (1782-1783) and the Constitutional Convention (1787); and his careers as a New York state legislator, United States treasury secretary (1789-1795), political writer, and lawyer in private practice. Most of the papers date from 1777 until Hamilton’s death in 1804. The Library of Congress finding aid has more information on all the information included in each of the reels. Hamilton’s correspondence begins with his boyhood employment with merchant Nicholas Cruger in St. Croix and continues through his service in the Revolutionary War, his participation as a New York delegate in the Constitutional Convention, and as treasury secretary. It ends with his last letters to his wife before his death in a duel with Aaron Burr in July 1804. Drafts, copies, and notes of reports; political essays, speeches, New York legislative acts, and more composed by Hamilton from the American Revolution until his death. Of note is an outline of the speech he delivered at the Constitutional Convention on June 18, 1787; his notes on debates and speeches at New York’s ratifying convention, June 1788; drafts of the four major economic reports he wrote as treasury secretary (on public credit, creation of a national bank, establishment of a mint, and development of manufacturing); drafts of the speeches he wrote for George Washington, including Washington’s 1796 farewell address; notes he took at New York’s constitutional convention of 1787; and drafts of some of his political essays. None of Hamilton’s Federalistessays are included. Papers documenting Hamilton’s career as a lawyer, which began in 1782. Most of these are ordered alphabetically by case. Some of the landmark cases included in his papers are Rutgers v. Waddington, People v. Croswell, Hylton v. United States, and cases forming the LeGuen v. Gouverneur and Kemble litigation. The financial papers, which form the smallest segment of the collection, consist of two volumes of accounts relating to Hamilton’s law practice, and a folder of miscellaneous receipts. Some of the receipts are for money Hamilton paid engineer William Pearce on behalf of the Society for Establishing Useful Manufactures to provide machinery for manufacturing cotton, 1791-1792.
Letters and other documents of members of the Hamilton, Schuyler, and related families, but not including Alexander Hamilton himself. The series contains letters from Angelica Church (Hamilton’s sister-in-law) and Philip Schuyler (Hamilton’s father-in-law) to Elizabeth Schuyler Hamilton; from Philip Schuyler to his grandson, Philip Hamilton; and from Elizabeth Schuyler Hamilton to her sister, Catherine Cochran, and to her son, Philip Hamilton. Through the marriage of Philip Hamilton to Rebecca McLane, several McLane family letters were incorporated into the papers. Most of the nonfamily correspondence of Elizabeth Schuyler Hamilton relates to the management of her properties and to arrangements for the publication of Hamilton’s papers. Scattered letters addressed to Alexander Hamilton (Alexander and Elizabeth’s grandson), James A. Hamilton, John Church Hamilton, and to members of the McLane family are also included. A mixture of original and copied documents. Included are certificates, military papers, legislative papers, newspaper clippings, writings, school exercises attributed to Hamilton, Hamilton family papers including Hamilton’s will, printed material, notes on the collection, and more. This series, consisting of material acquired by gift and purchase since the collection was microfilmed in 1981, was added to the Hamilton Papers in 1998. Originals include a letter from Nicholas Everton to Hamilton concerning legal matters and a Treasury Department circular. Photocopied material includes letters by Hamilton, miscellaneous images, and a page from a church register recording his marriage. This series consists of fifty-five letters, originally owned by Hamilton descendants, purchased by the Library of Congress at Sotheby’s in January 2017. Fifty-one of these, 1790-1804, are from Philip Schuyler (1733-1804) to his son-in-law Alexander Hamilton and daughter Elizabeth Schuyler Hamilton. The remainder consists of two additional family letters, a letter from Charles Pierre L’Enfant to Hamilton, July 14, 1801, concerning L’Enfant’s renovation of City Hall in New York into Federal Hall, and a fragment of a will in Hamilton’s hand, [July 1795]. Correspondence, reports, annotated drafts of the Constitution, writings, deeds, agreements, contracts, financial papers, certificates, and printed matter. These items were microfilmed in their original locations before their physical removal to this series. Included here are samples of lace made by women in Ipswich, Massachusetts. The lace was collected for Hamilton as an example of American manufacturing as he wrote his “Report on Manufactures,” 1791. On August 27, 1782, John Laurens was killed while leading a party of American soldiers in a skirmish against the British. Hamilton and Lauren had been extremely close, and Hamilton struggled with the news as he began his Congressional career. Hamilton and Laurens became friends when both were aides-de-camp to Washington during the Revolution, and the two had an extremely close bond. Ternant will relate to you how many violent struggles I have had between duty and inclination—how much my heart was with you, while I appeared to be most actively employed here—but it appears to me that I shd be inexcusable in the light of a Citizen if I did not continue my utmost efforts for carrying the plan of black levies into execution, while there remains the smallest hope of success. Just two weeks before Lauren died in South Carolina, Hamilton wrote him a letter on August 15, 1782 imploring him to join Congress and help him with the country’s next steps after the Revolution. It requires all the virtue and all the abilities of the Country. Quit your sword my friend, put on the toga, come to Congress. We know each others sentiments, our views are the same: we have fought side by side to make America free, let us hand in hand struggle to make her happy. Getting Your Hamilton Fix in Los Angeles! Now that the Hamilton Tour has arrived in Los Angeles, excitement is building! Here are some thoughts on experiencing Hamilton-esque exhibits in Los Angeles before or after you get your fix of the musical at the Pantages. While Hamilton obviously never lived in Los Angeles (although one of his sons is buried in Northern California), there are several places in town to see art and exhibits that relate to Hamilton and his era. LACMA (The Los Angeles County Museum of Art) in Mid-Wilshire has a sculpture bust of Hamilton’s mentor called the “Portrait of George Washington” by French sculptor Jean-Antoine Houdon on view at the Art of the Americas building. Although Houdon did not create a sculpt of Hamilton, he portrayed many of his contemporaries featured in the musical, including Thomas Jefferson and the marquis de Lafayette. The Becoming America exhibit at the Huntington Library in Pasadena has a collection of 18th- and early 19th-century American art works, including paintings, sculpture, furniture, ceramics, metal, needlework, and other related decorative arts. Every day art and objects from Hamilton’s time are available as part of this collection. The American Heritage Library and Museum in Glendale, operated by the Sons of the Revolution in the State of California has a collection of historical objects and artifacts of the colonial and early periods of America’s history. The museum is free of charge and open to the public. After his oldest son, Philip, graduated from Columbia and began training as a law clerk in his father’s office, Hamilton laid out a detailed schedule for his study. The schedule accounted for almost of all of Philip’s waking hours, from 6 am to 10 pm. Under Hamilton’s rules, Philip would read Law for seven hours a day, and study other subjects for another three hours a day, with some breaks for eating. and some leisure time for “innocent recreations” on Sundays after church. That is some intense scheduling! The full text of the rules, apparently from 1800, is reprinted below and available on Founders Online. Rules for Mr Philip Hamilton from the first of April to the first of October he is to rise not later than Six Oclock—The rest of the year not later than Seven. If Earlier he will deserve commendation. Ten will be his hour of going to bed throughout the year. From the time he is dressed in the morning till nine o clock (the time for breakfast Excepted) he is to read Law. At nine he goes to the office & continues there till dinner time—he will be occupied partly in the writing and partly in reading law. After Dinner he reads law at home till five O clock. From this hour till Seven he disposes of his time as he pleases. From Seven to ten he reads and Studies what ever he pleases. From twelve on Saturday he is at Liberty to amuse himself. On Sunday he will attend the morning Church. The rest of the day may be applied to innocent recreations. He must not Depart from any of these rules without my permission.